First wear. Nice, but where's the bust-to-waist change? We know from last time that the Vernet 1.0 dress is a work in progress... However, 1.5 years into it, I have yet to write up how the first edition was actually constructed. At first, it seemed possible to pile everything into one post, but as I went through the notes compiled during 2015, it was soon clear that I'd have to break things up into background and evidence, and actual construction. In years past, when a project would really take my fancy, I spent months researching and collecting whatever evidence I could manage to obtain from sources online - magazines, novels, fashion plates, an occasional manuscript, photos and documentation of extant garments. Then I'd muse all about it online, like so many of us do, as with the silly number of posts I made about the 1790s sleeveless spencer. For a while, I was able to turn to actual garments from my own collection, as with the 1870 Bustle Dress. Despite Ohio's several excellent museum collections being just a few hours away, I've never had the freedom to visit them. My own stuff, obviously just study specimens and nothing special, was great fun to work with, but is now largely dispersed, gone to Cassidy of A Most Beguiling Accomplishment. If you read some of my earlier posts, you'll see the efforts of someone with more interest than proper background, and so it made sense to give things to someone with both the training and the equipment to care for them properly and make better use of what they have to tell. In most cases, whatever research I did I wrote about nearly immediately, posting as the information came to light. It's frustrating that the Vernet project came along when it did, just when the life of our household, and my own life, was full of change. Within the space of just a few years, my part-time job in public health, which I love, became more taxing than it used to be, the twins grew up enough to start piano, and YMCA soccer, and homework, and to dip into other fun that we could enjoy together -- fossiling -- a tee-niney garden, vacation Bible school. Chronic illness of one sort or another blossomed. It's common, you know: one chronic illness begets another; our bodily systems are all interrelated. I have a transplant, and the effects of long-term medications and transplant-related fatigue made it easier for other problems to arise: migraines, diverticulitis (now those episodes were fun, dangerous, and expensive), and now the formally diagnosed type of dyspepsia that makes eating a pain. Now I understand what novels mean when they describe a crabby person as having a dyspeptic personality. Try me when I am cooking dinner for my family, a dinner that I cannot eat, and you'll have a nice sample of it. Then, you can't forget age. I don't mind it, aging. While crepey skin on my hands is creepy in one way, it's something that ties me to the many beloved people who have gone before me, and the years of living and suffering and just dealing with what comes have made me love what I have the gift of having right now the more, and make me more ready to share it, because really, what is a gift when it's kept to onesself? There's no point in that, as my own faith and that of others will readily tell you. Meanwhile, ever after the roots of things that make up garments, I went after threads, and discovered spinning, and then fibers, then wool, and then -- SHEEP. Oh dear, if ever there was competition for costuming, it's the fibers that make the fabric, and the animals that make the fibers. The result? The inevitable sequela? I don't have much time to begin with, less energy to get on with, and I am splitting it umpteen ways -- job, children, husband, stupid illnesses, sheep and the world of making textiles, and costuming. It's no wonder Vernet is taking forever. So, how did I set up construction? What evidence did I use? Here is the thought process. Let's start with the dress fabric or fabrics. We don't know for sure what fabrics were used. It could be cotton, and arguably might be. 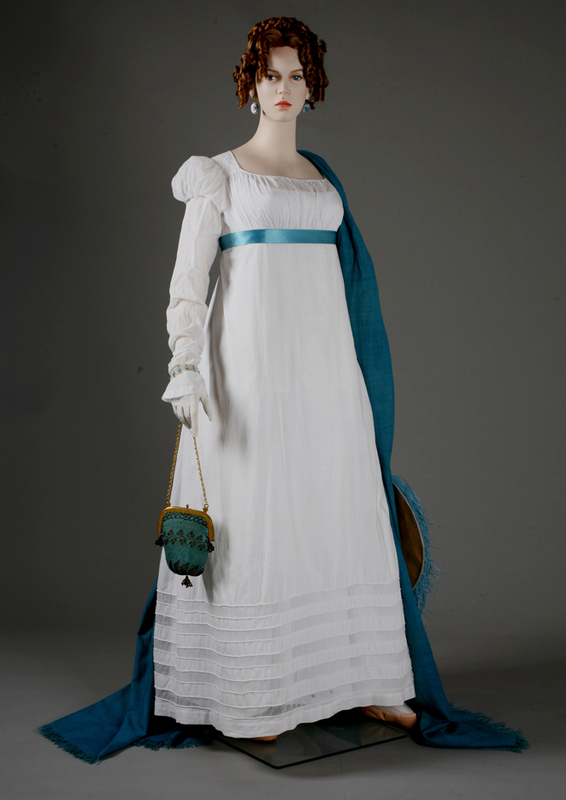 In Journal des Dames, just about all of 1814 is dominated by percale white dresses for promenade and morning. 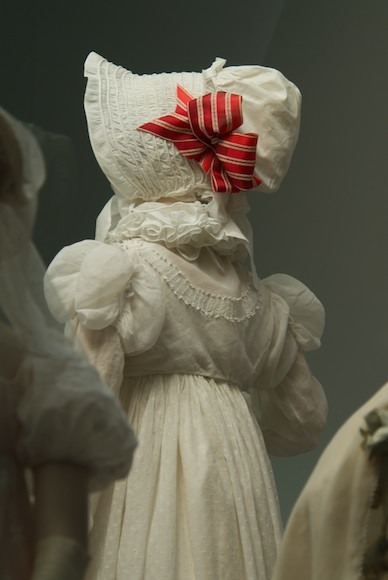 A few mousseline (a nice clear muslin) dresses appear -- they are sheer -- as well. 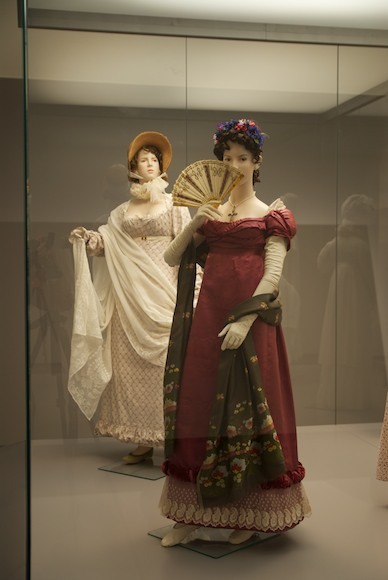 The Napoleon and the Empire of Fashion exhibit’s Annette model wears a dress of percale and clear muslin that has several similarities. Although Vernet departs from norms in proportion and in accessories, he appeared to follow the mode in that he showcased so many percale dresses. In this case I think the underlayer is percale, with a clear muslin overlay used for bust poufs, sleeves, and the skirt. 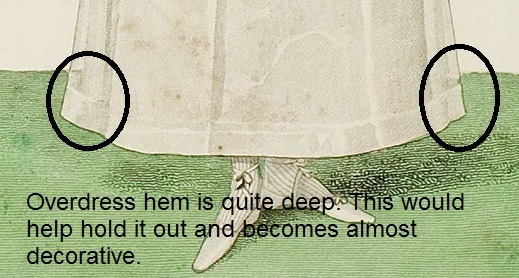 That there is an overlay is apparent in several places: the arms show through the sleeves, the underdress shows through the bust puffs, and the green grass shows through the overdress hem at the horizon line. A previous thought of mine was that the styling with the large bust poufs is usually seen in full dress, especially in ball gowns. 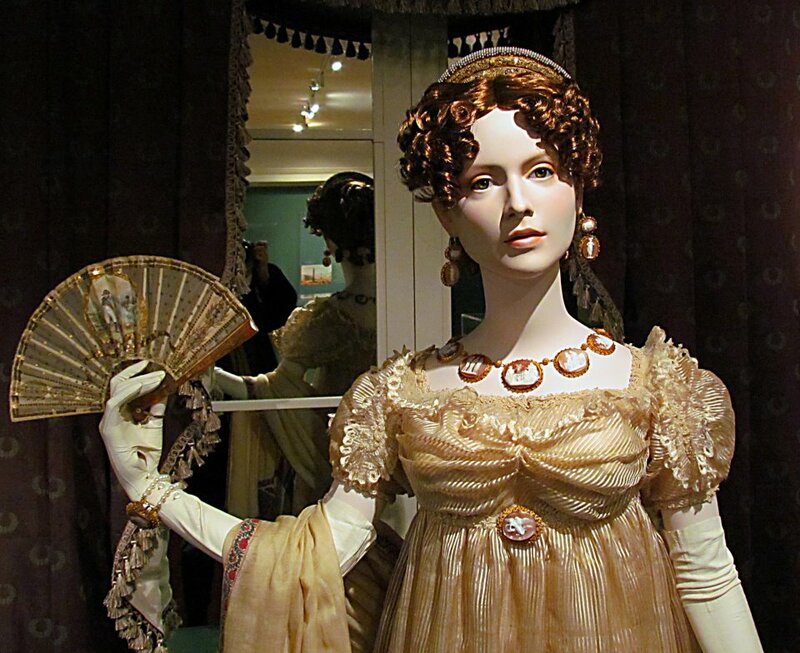 Christina Barreto Lancaster's Hillwood Manor exhibition model (shown further down in this post) is an example. If our Vernet plate were a more formal dress, a crisp silk would hold the poufs nicely and the skirt body would hold well, too. Perhaps the silk was what has been known since as a silk ninon, although I was unable to track that fabric back to 1814. If it were, Vernet may have been playing with words, associating the fabric with Ninon l’Enclos. 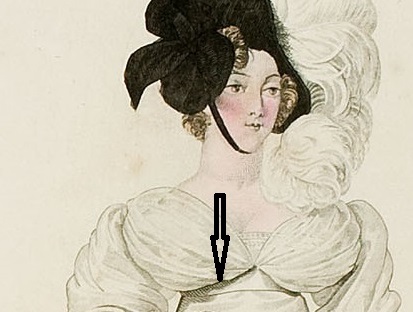 Looking at the dress plate, and how strongly Vernet indicated the join between the bodice and the skirt, it's fairly clear that the overlay is not an entire dress set over a slip. Instead, the bust poufs and the sleeves are mounted to the bodice. We already know what I imagined about the embroidery, based on when the dress came out, at the end of Napoleon's dominance over France. Here's another 1814 dress, just about covered in the embroidery with cutwork; the idea was quite popular, it would appear. 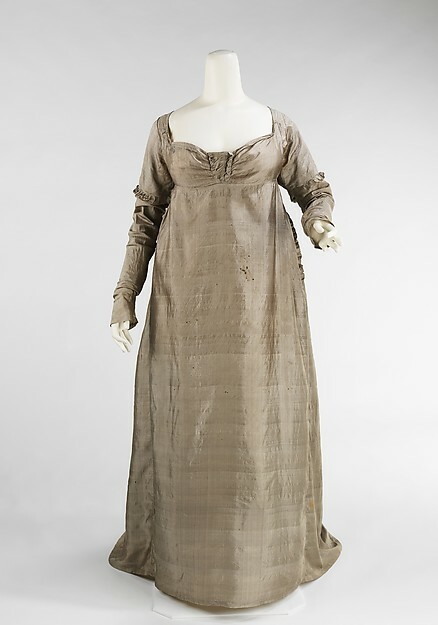 Cotton and silk dress, French, 1814. Met: 1984.81. It could also have been something else. At one point I thought the little indication of decor could have been a bit of gathered ruching, as in Portraits des Soeurs, 1814, by Jacques-Augustin Pajou, from the Louvre. Or it may simply be the pulling of the thin muslin on the drawstring, as in this dress from the Met. Yes, It IS possible to have a drawstring on a straight neckline. Here is Cecile from Natalie Garbett’s blog. The strings could be anchored at the straps. 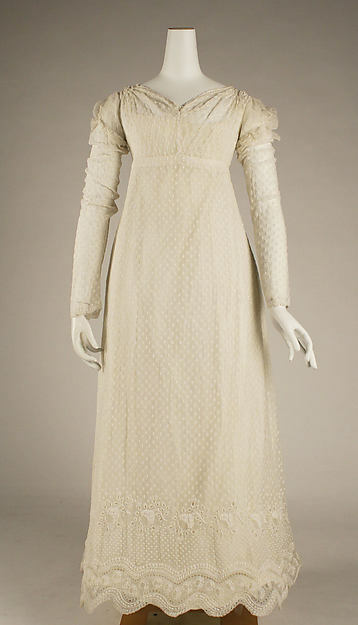 Another dress, from Augusta Auctions, this one in a plain muslin embroidered at hem. This sort of neckline just isn't very exciting, and Vernet enjoyed trendsetting fashions, as we know from his other plates. I went with the idea of embroidery. After all, I had evidence that decorated underpanels or underdresses were fashionable. Here are two from Natalie Garbett’s blog, in her post describing her first dress of 2012. Note that in all the dresses shown so far, the shoulder straps are set very far to the edge of the shoulders. This is the norm for the entire year in both lower-necked dresses and high-neck dresses. I made sure that this would be a feature of the Vernet dress. Straight straps attached to straight panel. They would be easy to modify if you have a fit issue, even though it means two extra seams. A single-piece for front with very wide curve, hidden by bust of overdress. They would be harder to modify if there were fit issues, and finicky to sew the drawstring channel that would accompany this type of neckline. I threw out the latter idea as less likely. The bust poufs, I thought, might be made most easily with one piece of fabric. Not being privy to the construction of any dresses with bust poufs, I made a guess. I would use a single piece of fabric, either rectangular or shaped like an horizontal oval pointed at the two sides, accordion-pleated and divided by very thin thread band at center. Wider bands dividing the poufs appear on ball dresses of the period (see Christina Barreto-Lancaster's Hillwood Manor exhibition example below). The outer edge of the poufs would be turned under and tacked down to the strap lining, then covered by the sleeve fabric and the strap fashion fabric. Here are far more tailored versions of the bust poufs (the same exhibition). From earlier, a rudimentary bust decoration that later would become puffier. Silk dress, American, ca. 1805. Our Ninon wears her sleeves quite full, the diameter gently tapering to the fashionable elongated wrists. Annette, in the Napoleon and the Empire of Fashion exhibit, wears a more tailored version of the very long sleeve. Ends plainly finished with rolled and whipped hem. In our fashion plate, the bodice waistline is plain: there is no narrow belt piece between bodice and skirt. The stress, then, would be taken by a lining, I would think. 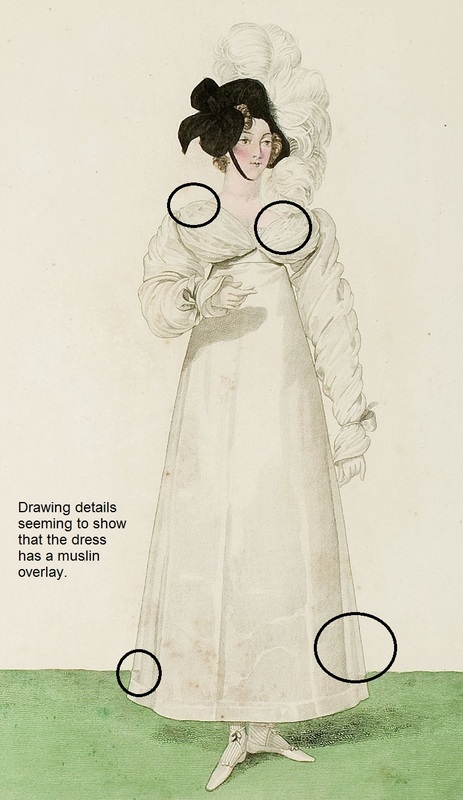 It is possible for unlined dresses to have a plain join too, though: witness Cecile on Natalie Garbett’s blog post about underpinnings in Napoleon exhibition. 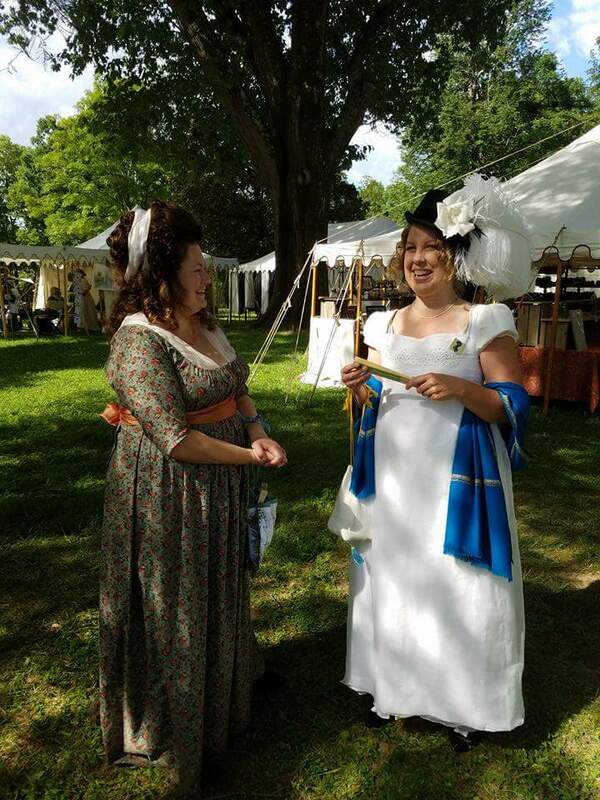 As so common with Regency dresses, and with earlier petticoats, too, the skirt's upper raw edge could be simply turned to the inside and the skirt whipped to the bodice. At this period it was common for dresses to be back-closing, with two wide back panels hung on drawstrings that simply tied at the center, allowing for changes in fit. I went with the popular mode. There is really not really much to remark upon here, except that the dress dress ends two inches or so above the anklebone. Rather a trendy length. Note too the rather significant hem on the overdress. I've marked it in the plate. The double layer would help the hem round out nicely, and almost forms a decorative touch, in that the doubled fabric will create a shadow effect. That's that. Next time, and really, I do mean it - construction. I figured out the construction and wrote it all out before making the dress. It was a good plan to do so, and it worked, even if I did spoil things by wearing bad stays. The roots of the dress are still good. I love reading about the breakdown of how you plan a dress, which is what I like to do too. I shared your blog on my FB page because this is so pretty. Thanks! That means a great deal, coming from you especially. You're wonderfully organized, which is probably one of the reasons you're able to give so many and so varied talks. Even if the dress is taking forever, and determined to finish it and make it a success. Then people get to see variations on it for the next umpteen years as I renovate it for each Jane Austen festival. A very pleasant read and I'm so happy to learn more about this special dress style, which Vernet has chosen for his series. I'm already very curious how the dress with the fluffy front will look, it's amazing to see these dresses come to life.